This dog's name is Storm. He has soft grey and white fur, Blue eyes and a collar with his name printed on it. 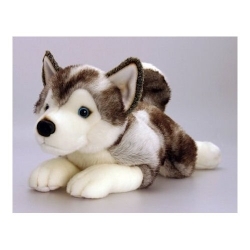 A Lovely high quality soft toy Dog Storm 25cm long from Keel Toys. This year's new addition to their Dog/Puppies range of soft toys with enhanced face and paw features.